I've been procrastinating updating because in my mind, it hasn't really reached a priority, until about now. I've been busy trying to catch up with other things, cleaning things, trying to set my internal clock back to normal, etcetera, etcetera. So, I came back June 15. The trip I went on wasn't a holiday- it was a missions trip. It was great. To sum it up, it was intense, amazing, challenging, tiring, and a divine blessing. 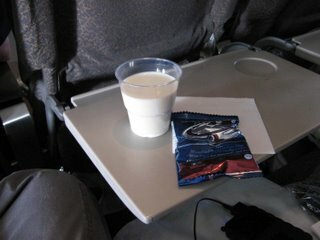 This was on the flight back... my first cup of milk in 6 weeks!!!! I was so excited! Woohoo! Milk! This was supposed to be my "excited" face. This was my expression right after I tasted it. 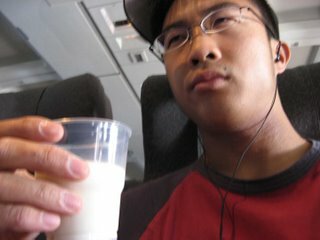 It tasted like milk, but not like milk from home (2%) . But it was still ok. That's why I don't have a disgusted look, it's more like a "Hmmm.... eeh... milk?" look. So, those three pictures basically sum up the trip! Nah, just kidding. If you would like to read my update letter about what happened, or have questions, just leave your name and number after the beep. Wait, wrong technology. 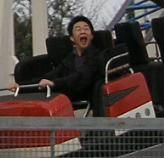 Electronic mail me. There that's it. God is great! All glory, honour, praise- belongs to Him. Ask me why if you don't understand. It's good to be back. But I miss it dearly. Gas has been at about the 114¢/litre range. Apparently, it was near $1.30/litre while I was gone. And the loonie was at 93.76 ¢USD the day I got back. Crazy! 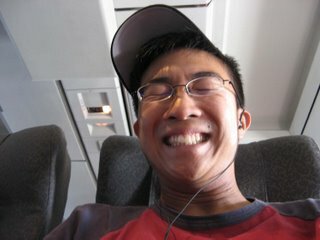 Heh.. Did the people sitting next to you look at you funny when you took these pics?